American offshore wind has the potential to produce over 2,000 gigawatts of power—that’s well over double the amount of energy consumed by the U.S. each year. And, unlike land-based wind farms, offshore wind is more consistent, abundant, and reliable, making it much easier to integrate into the grid. There’s just one small hiccup: bats and birds. 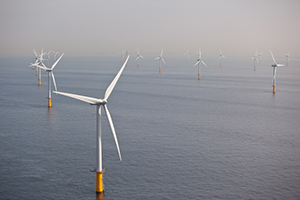 How bats and birds behave in the presence of turbines and the effects of offshore wind farms on migratory patterns remains unclear. 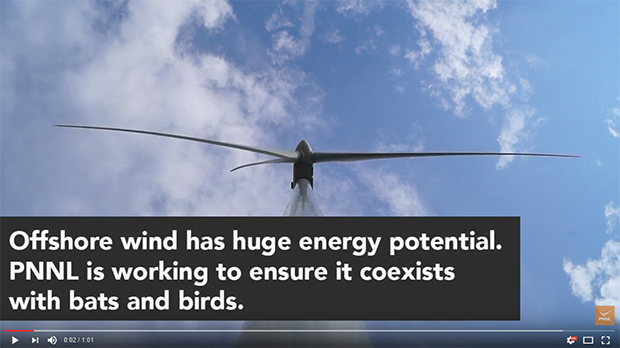 By better understanding the different species affected—where they live, where they fly, and at what times—developers can accelerate the siting and permitting process, increasing widespread deployment of offshore wind farms. PNNL researcher Shari Matzner set out to answer these questions. Continuous monitoring of offshore locations is necessary to get a complete picture of animals' behavior patterns. However, monitoring offshore locations is difficult for several reasons: limited accessibility, harsh weather conditions, and nocturnal migrations of bats and birds are difficult to see in the dark. Using thermal video, Matzner found a way around these limitations. Thermal video works both day and night and in low visibility conditions. Even better, it is a mature, cost-effective technology. Matzner recorded animals off the Washington coast with a thermal video camera and developed a software application called ThermalTracker. The open-source software quantifies the flight tracks of birds and bats by the time of day, direction of travel, relative size of the animal, and more. This information, combined with other characteristics inferred from ThermalTracker, can be used to determine what species of animals live offshore. Using a standard desktop computer, ThermalTracker extracts flight tracks of birds and bats from the thermal video recordings and characterizes animals’ flight tracks in quantified terms. After processing, ThermalTracker produces an output that can be readily analyzed using common statistical software like Microsoft Excel. After developing ThermalTracker, Matzner tested it for accuracy. The test results showed ThermalTracker detected 81 percent of all the animals recorded. The missed detections occurred when animals were too far away or during very cloudy weather conditions. Perhaps the most impressive attribute of ThermalTracker is the processing time. Data processing can be performed at roughly the same as the video duration, implying real-time processing is possible. When human experts reviewed the same footage, it took, on average, five times longer to generate the same data as ThermalTracker. 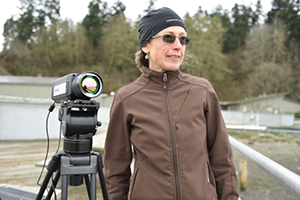 Shari Matzner uses a thermal video camera and ThermalTracker to identify wildlife in Sequim bay. Two ThermalTracker models were developed for species identification. The first is based on the shape of flight tracks. Combining flight track data with the time of day allowed researchers to correctly classify 82 percent of the animals observed in their test data. Animals were classified as gull, tern, swallow, or bat. The second ThermalTracker model is based on the wing beat frequency of common North American sea birds and bats; it generates the likelihood of different species based on wing beat frequencies. The two models work together to more accurately identify animals. The next stage of development will incorporate stereo vision into ThermalTracker to estimate the distance of an animal, its approximate size, and ultimately improve species identification. Using ThermalTracker, offshore wind researchers can collect the data they need to better understand the potential effects of offshore wind turbines on bird and bat populations. This cost-effective technology can help developers fulfill environmental monitoring requirements, and regulators can be better equipped with accurate data about bird and bat behaviors around offshore wind turbines. The open-source software, ThermalTracker, can be downloaded here.